Just study this if you want to pass the exam: The computer Motherboard or shortly MOBO is one of the most important part of the Personal computer (PC).It is a hardware of the computer installed inside the system unit(CPU).This MOBO hardware act as the main board or the central or core assembly of the computer system unit.In other words inside of the CPU case there are a lot of other hardware's connected to the MOBO,namely:Hard Disk Drive(HDD),CD/DVD ROM,USB Card reader,FDD Drive,processor,RAM,LAN card,Wireless LAN Card,USB expansion board,VGA Card, and the Power Supply Unit(PSU).These are all types of hardware's inside the system unit of the Personal Computer. Computer motherboard designed to take advantage of the most demand application of a program. 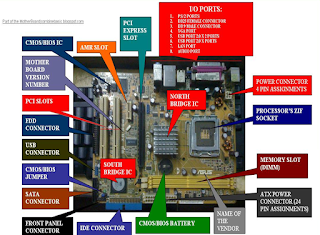 One of the most application is to meet the system requirements of the 3G application.Just like the movie games as high innovative applications of computer programming.As the form factor of motherboard as a series of versions of the MOBO from AT,ATX,BTX,LPX,and NLPX.Compatible words being broadcast,that's why it is the MOBO will synchronized the speed of processor,RAM, and Video Card(VGA).Unlike only if the MOBO is built-in through the Input/Output ports. So,lets talk about the Motherboard parts and function to enable you to familiarize the parts and function.This is the most practical approach of the technician. (See the picture above). 1. I/O ports- this is located in the rear panel of the CPU,this use to connect the outside hardware or peripherals of the computer. DB 9 male connector(Serial or com1 port)-this use to connect a serial device of the computer,such as the serial mouse and external modem. VGA port(built-in)- this is use to interface the DB cord of the monitor screen or to connect the monitor screen of the computer.The fastest video card versions are base on the standard of the vga slots,ex: the AGP and PCI’e card. USB 2.0 × 2 ports- these are the ports of the usb devices of the computer.Attached externally of the system unit,one of that is the USB flash drive.As of now the versions or speed of the USB are the 1.0 and 2.0 compatible. LAN port- this called as Local Area Network of the computer.This is use to connect the numbers of node or workstations(PC)to form a local area network of the computer with in their area.Using the a type of communication media such as the network switch and router. 2. ATX Power connector(4 pin)- this is use to connect the 4 pin of the power supply unit(PSU) .This is separate of the 20 or 24 pin of ATX power supply to provide DC voltage of computer processor. 3. Processor’s ZIF Socket- part of MOBO use to hold the processor or CPU chip(Zero Insertion Force).The compatibility of the socket depend of the computer processor type.Such as the AM2 socket of the AMD and the socket 775 of the Intel company. 4. Memory slot(DIMM)- this is called as Dual Inline Memory Module,this is the slot of computer memory or what we called RAM.The memory slot depend of the type of the memory.Such as the PC 133 SDRAM and PC 400 SDRAM-DDR 1. 5. ATX Power connector(24 or 28 pin)- a group of connector of the MOBO,This is separate of the 4 pin power assignments.Its provide a DC power output to the system board(SB)from the output of the Power Supply Unit. 6. Name of the Vendor- this is the manufacturer name.This is important to know the manufacturer or vendor.So you can download through the internet site the drivers software of the MOBO. 7. CMOS/BIOS BATTERY- In this part, the CMOS/BIOS battery is hold,so that it can provide 3 volts direct current/voltage to the CMOS IC to preserve the BIOS settings of the computer.Such as the time module,hardware information and settings/parameter,etc. 8. IDE connector(Intergrated Drive Electronics)- this connector is use to connect the IDE cable of the HDD(Hard Disk Drive) or CD/DVD ROM to the MotherBoard IDE. 9. Front panel connectors(F-Panel)- this is use to connect the Power LED,HDD LED,Power Switch,and Reset switch of the computer system unit(CPU). 10. SATA connector-this is Serial Advance Technology Attachment.The new standard of the IDE connection array of the computer HDD(SATA HDD)to the motherboard system. 11. CMOS/BIOS jumper- this is use to disable the BIOS default setup.Such as to disabled the supervisor password of the BIOS. 12. USB connector(header)- this is use to connect the USB port of the front panel USB 2.0 x 2 port. 13. FDD connector- the connector of the FDD cable through the system board.Normally there are 34 pins out of it to connect the 3.5” 1.44mb Floppy Disk Drive. 14. PCI slots- a part of the computer motherboard use to connect the I/O cards of the computer.Such as LAN card,WIFI card,USB expansion card,and sound card. 15. Motherboard Version number- here you can get the version of the motherboard driver software.So that you can download it exactly to the manufacturer website. 16. CMOS/BIOS IC- this is the type of BIOS IC being use by the computer MOBO.A set of a program being installed in this IC to preserved the BIOS configuration settings of the computer.Such as the speed of the CPU chip and RAM, etc. 17. AMR slot- this is the AUDIO Modem Riser.Being use to demodulate and modulate the analog audio of the computer. 18. PCI express slot- a part of the computer that hold the computer video card(VGA), the PCI’e card.The latest and the most fastest card being installed and most compatible with 3d and 4g gaming of the computer.The old video card type is the AGP or Accelerated Graphic Ports and the standard of the PCI’e. 19. North Bridge IC- is a passion name as being north of the PCI buses or the PCI slots of the MOBO.The true name of the north bridge is MCI or Memory Controller Hub.Assigned to manage and control the computer memory before the processing of the CPU chip. 20. South Bridge IC-is a passion name as being south of the PCI buses or PCI slots.The true name of the south bridge is I/O Controller HUB(ICH).Its is a type of microchip task to control all the Input and output devices of the computer.Such as the keyboard and mouse.And the monitor screen of the computer, that commonly found at the rear back of the CPU or system unit. 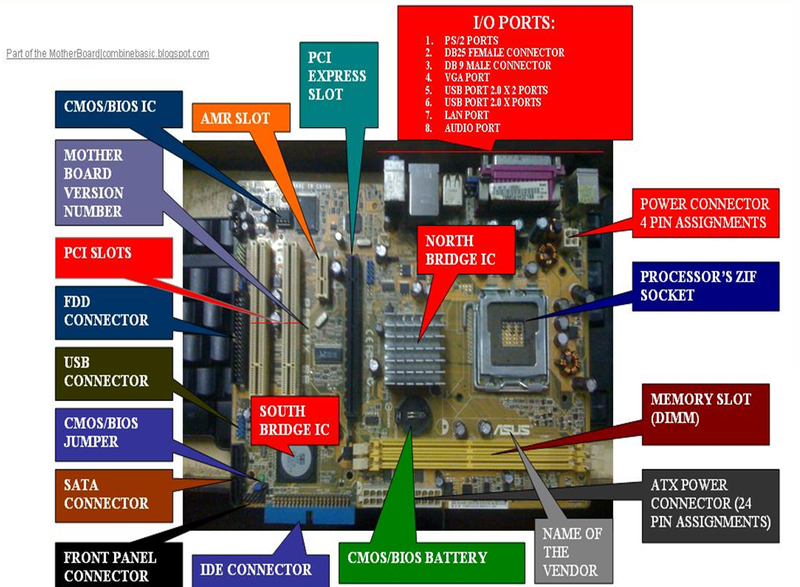 The detailed post give us complete understanding of mother board and cpu. The step by step discussion give us flow of info in terrific mode. Anonymous all the parts are given and the use and function including the acronym..Kindly tell me what you need or any question regarding acronyms. What is PCI sir BTW??? Hi Troynez PCI is Peripheral Components Interconnect- this a slots found in the mobo, this is use to insert an adapter card for a certain functions like WIFI cards or wireless cards. PCI'e slots beside of the PCI slot in the new generation mobile it is used to insert a VGA cards or video cards for your computer. Thanks a lot Arnel for this info....it helps me a lot on my review about the parts of motherboard as I'm preparing for job entrance exam here in the Netherlands.I'm so proud of you Kabayan!Mabuhay ka... God bless. Thanks for that Jean...I'm happy to help you and other people.Are you graduate of CHS of TESDA? IT helps a lot i will take an exam of chs nc2 tesda. Hi Charlos thanks for your visit here, you have a nice site. Can you be my quest writer in my site? Just contact me in my email greencomval@gmail.com or use the contact page of this site. Hi Bro thanks for your visit, Yes that is true what you said here. There are motherboard maker uses different chipsets from other company like Intel and nvidia. And they uses also processors chipset like they use for northbridge and southbrige. Motherboard or mobo is the central sub-assembly of computer without this main part that CPU and memory or RAM can't work. It's very important that both of this devices as main part working together.